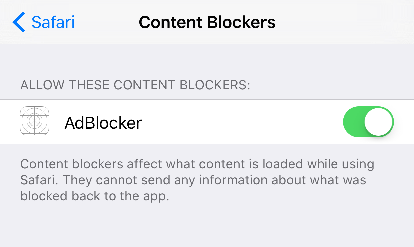 With iOS 9, Apple introduced a content blocker mechanism into Safari. Rather than provide a hook by which content blockers can provide a yes/no answer to each individual URL or resource as it loads, a content blocker is expected to serve up a configuration list — essentially, a set of URLs combined with a yes/no answer. This allows the web browser to compile this into the most efficient way of working with the format and to maintain a known good/bad list of websites to avoid consulting the blocker on each lookup. The next version of OSX, El Capitan, will have the same content blocker engine. The other aspect is that this separates out the content blocker from the history or application state of the websites being browsed. A content blocker can say ‘Don’t go here!’ but it doesn’t get to track each site that you visit - if it did, there would be a strong desire for the content blocker itself to monetise the user’s personal browsing history. The content blocker configuration is a simple JSON file, with an array of rules at the top level. Each rule is represented as an object and has two fields; a trigger, which says when the rule is active (for example, based on the URL of the site you are visiting) and then a corresponding action, which says what Safari should do about it. 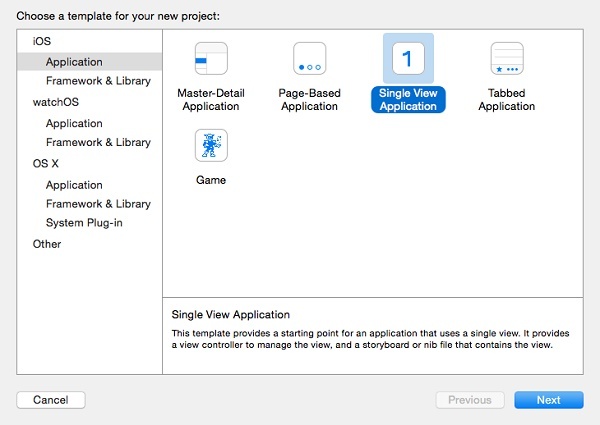 Once the template has been created, the application can be run using Cmd+R in Xcode. This will launch the dummy application and install the application content blocker at the same time. 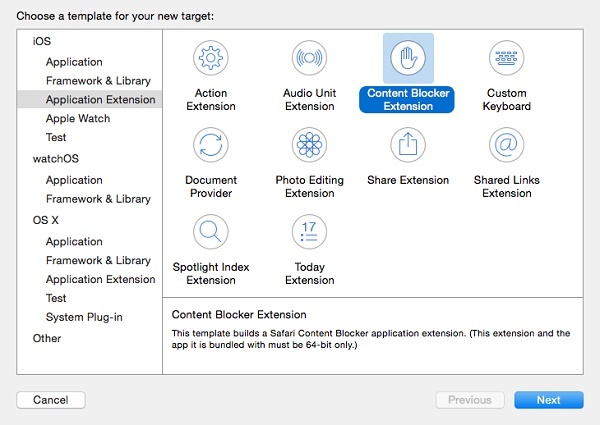 The individual extension blocker can be seen by going into the Settings app, then in the Safari option there is a Content Blockers seen when one or more blockers are installed. Not only is this the way ad blocker programs will ask Safari to reload the block list, it also provides a means to determine if there is any errors in the block list itself. There isn’t any easy way of debugging the ActionRequestHandler itself because it is running in a new process which isn’t attached to the debugger. Furthermore, log output (generated with print or NSLog) will be routed through somewhere other than the Xcode console. The error returned by the callback will be nil if there are no errors, and will contain enough information to identify what the correct solution should be. The block list provides a number of other actions which can be done to limit certain types of resources. The url-filter is used as a quick test to determine if the rule may apply to a particular resource. Further tests can then be implemented to provide a way of blocking particular types of resource or whether it is loaded from the current site or not. Since the url-filter is a regular expression, using a * on its own is not sufficient. The dot means ‘any character’ and * means ‘zero or more’ — so the . * will match any URL. If the type being loaded is a script or an image (i.e. loaded by the <script> or <img> tags) then this rule will fire. The load-type here can be either first-party (from the site itself) or third-party (from other sites). If a site uses a content delivery network (CDN) for its loads then this may cause problems; but for the most part, sites that have first-party loaded scripts will continue to work whilst third-party sites are often used by ad networks. Note that the unless-domain is a string, not a regular expression; and subdomains aren’t tested (so infoq.com would not have the desired behaviour). It’s also the name of the site you are on, as opposed to the site you are connecting to; in essence, it allows sites to opt-out of the load behaviour. This will match any one of the blogspot domains (people visiting blogspot.com tend to get redirected to a country-local suffix like blogspot.co.uk) and then use the css-display-none action to simply hide that element from the display. This performs a similar rule to the way that some ad blockers work today by hiding elements with a known ID. Provided that the ID of the element in the DOM doesn’t change, this will remain stable. Multiple selectors can be provided as a comma-separated string, like how CSS works today, using the css selectors level 4 draft. Content blocking in Safari provides a powerful way of determining what scripts a user is prepared to load, without exposing the content blocker to the URLs that the user is visiting. It uses regular expressions to match domains but can provide exclusions to allow certain sites to keep visiting. As with other ad blockers, a web page can selectively have elements cut out of them. It’s unlikely that advertising networks will sit still. For example, they may request that ad sites host copies of the script (instead of dynamically including them remotely, as they do today) or ask the advertiser host to set up a network proxy that will route requests through. Using hard-coded hostnames as a blacklist (such as doubleclick.net) is unlikely to last; advertisers will simply burn through temporary domain names as a way of evading blockers. Starting with a blacklist that encompasses everything is likely to be the only way to prevent this from spreading, and then selectively enabling certain domains or sites. And whilst the JSON format and rebuild-when-you-want-to-change it won’t be appealing for many, the content blockers rising to the top of the store will provide user-friendly ways of configuring these rules in an easy-to-use manner. Dr Alex Blewitt was introduced to object-oriented programming with Objective-C on a NeXTstation over twenty years ago and has been using the platform ever since. With the release of Swift showing the future of the OSX platform, Alex has written a book, Swift Essentials . In his spare time and if the weather is nice, he has been known to go flying from the local Cranfield airport.